Help the alien get home by breaking all the bricks in his way. 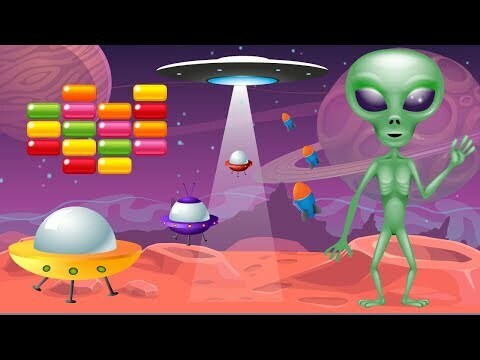 Alien Brick Breaker is a classic brick breaker game that's addictive and enjoyable to play. Play as a guest or login with Facebook to play with friends. Five different music tracks, with lots of sound effects. Touch anywhere on the screen to release the ball and move the bat. Control the ball by bouncing it off different sides of the bat. Get a higher score by breaking bricks one after the other. Play levels over again to get a higher score. Large - 10 different colored bricks. Small - 10 different colored bricks. Ice - Ball goes straight through. Stone - Hit three times to destroy. Solid - Cannot break. Ball bounces at random angles. Oneway - Only breaks from the top down. Invisible - Turn the ball invisible until it hits the bat again. Gold - Doubles the score. Rainbow - Turns solid bricks into colored bricks. Timer - Finish level before the time runs out. Speedup - Speeds up the ball. Black holes - Ball is lost. Transport - Ball appears in a different place. This game is similar to the old games but with many new and different features. If you enjoy brick breaking games this game will keep you playing for hours.